← White Stationary Object Like Fluffy Cloud Seen High in the Sky. 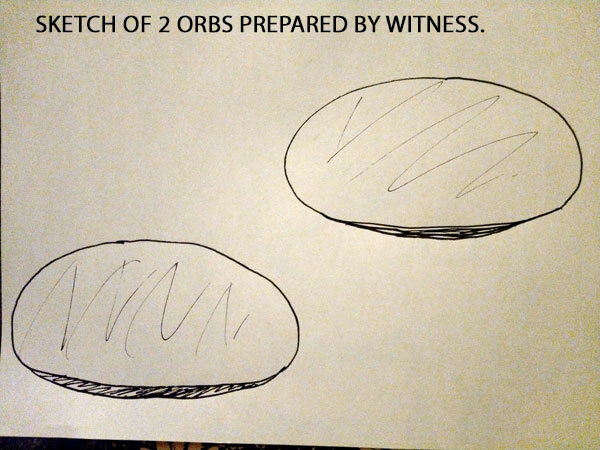 SKETCH OF 2 ORBS PREPARED BY WITNESS. Description: Here’s my report, with two attached sketches. Just a heads up, the website didn’t work on my phone in chrome for some reason using HTC U11 Android operating system and it kept saying forbidden when I tried submitting twice. It was odd. So last night at 8:45 PM (7-18-2018) I was watching the sunset in Skyway looking Northeast towards Lake Washington and downtown Seattle, but more towards Bellevue I would say. From where I was looking and at first I just saw one orb like flying object kind of gliding in the sky and not making any sound or emitting any vapor. I yelled to my partner to have him come see it, but he was not feeling up to it and was scared to look and then have nightmares or have any weirdness from seeing them. I went back out and I then saw two! Both were the same size gliding at the same speed and moving very gradually in various directions and different angles, but so slowly that you would hardly notice it change it’s angle. I just watched them slowly glide off over Lake Washington, Renton and Mercer Island area or even closer as I was not sure if they were drones. When I saw two, I didn’t believe it could be a drone. I had felt anxious watching them, as it was so foreign to me, so I went inside and didn’t take a photo or watch too much longer for fear of any freaky stuff occurring. It was very frightening actually although they were so small and seemed like they were almost too small to have a human in them, but possibly they were remote operated or drones. The general shape of them were dome like bubbles slightly oblong and seemed to have more material on top of the craft. There was no visible seam or welding of the top and bottom parts, so they were very unusual and were probably the size of a Volkswagen Bug. I saw no propellers, indication of any propulsion pushing it in any direction. They just glided slowly and very stealth like, as if trying to not draw too much attention. Perhaps they were being operated by someone not too far below on ground perhaps, but I highly doubt it. They seemed to be only a mile away from me in the sky I would say, with one slightly further and higher up than the second one I saw. When I returned to the front yard I realized I was seeing two now and the second one was closer and a bit lower than the other and further back, by about a half a mile from one another, but seemed to be together, gliding in the same direction. The color was most similar to a dull/matte silver/grayish color. They were solid in color and I saw no lights or holes or anything on the surface of the craft besides it’s shape and smooth movement. This entry was posted in Emotional effects, Oblong shaped, Orb-like craft, Possible drone, Possible UAV, silent, Sketch, UFO Sightings 2018, UFO Sightings Washington and tagged Silver colored, Slow movement. Bookmark the permalink.